At 7.30pm, Pam Butler opened the Meeting and welcomed two guests. Guest Speaker, George Stamatis has taught high school Science and Maths for the past 11 years at North Lakes. He also runs a bromeliad nursery in Elimbah. He has B.Sc. in Botany and a diploma in Horticulture. George grew up in South Africa, and his interest in horticulture started around age 9. 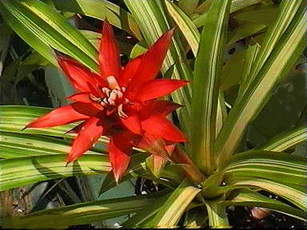 George purchased his first bromeliads from Nigel Thomson who also lived in South Africa at the time. George was inspired by many successful hybridisers such as John Arden, Pamela Hyatt and Paul Isley of California, and David Shiigi and David Fell of Hawaii. 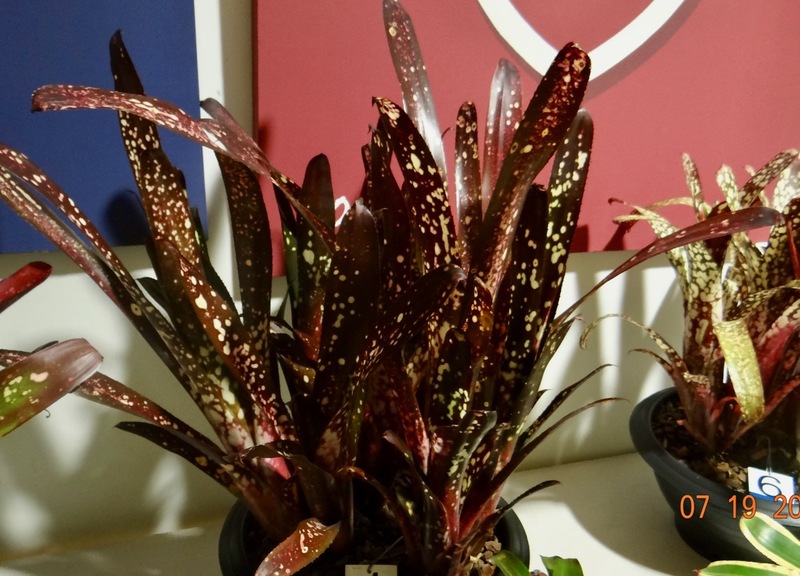 He produces new bromeliad varieties mainly in the genera Vriesea, Tillandsia, Dyckia and intergenerics in the Tillandsioideae subfamily. 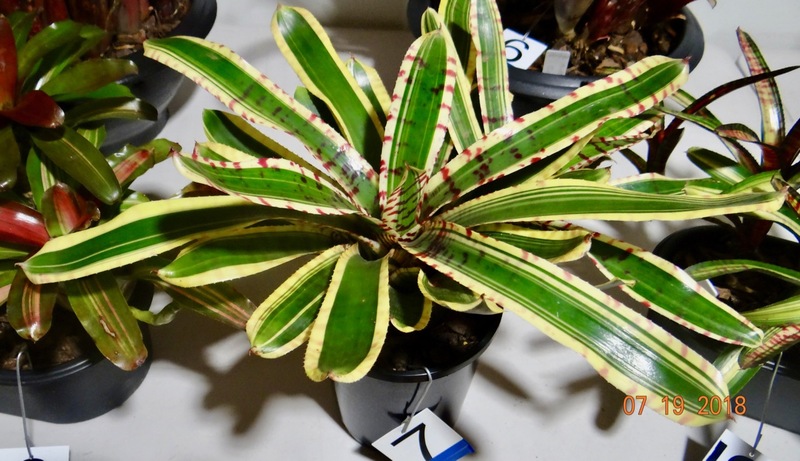 His topic was Intergeneric Hybrid Bromeliads, which are those plants resulting from a cross between two or more different genera. bigeneric plants are produced by crossing plants from two different genera. Up till now, this hybridising has been limited to two genera. This term has been replace by the term ‘intergeneric’ because there are now at least two hybrids made from three different genera. These will be described later. 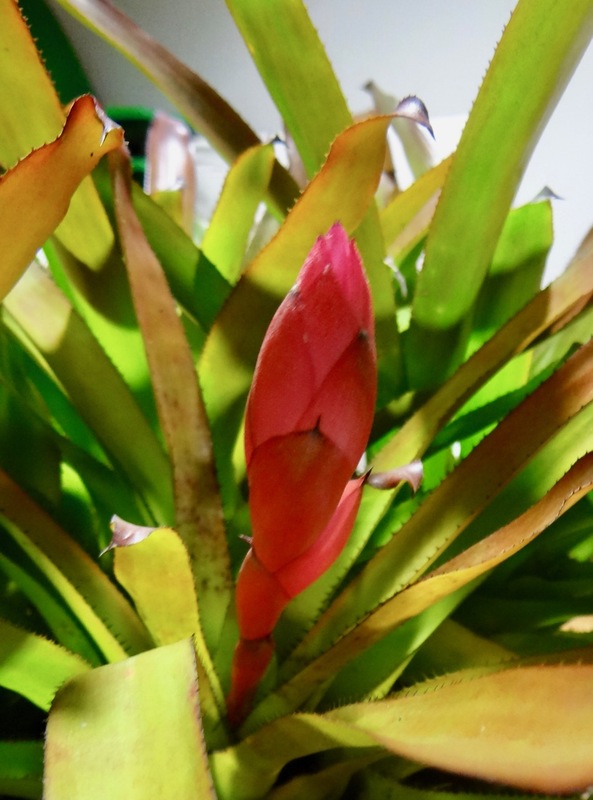 Until a couple of years ago, there were just three Bromeliad subfamilies but now there are a total of eight. 3.Pitcairnioideae, and this has been split into six. Most intergeneric hybridising has used genera in Tillandsioideae, this is the area of George's chief interest. 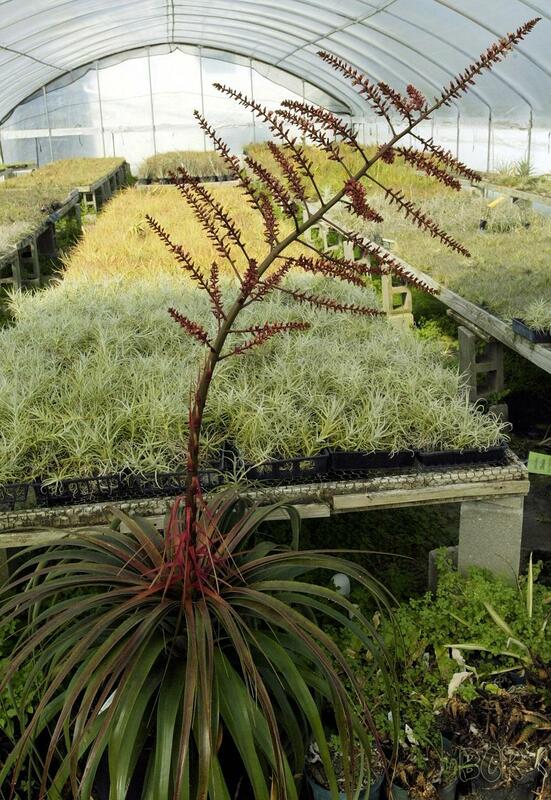 xRacindsia RD (Racinaea x Tillandsia). Chester Skotak in Costa Rica. xGuzvrieseas : many were produced by Herb Hill but no new ones for some years. xVriecantareas were made by John Arden using chiefly Alcantarea glazouiana, Alcantarea regineae, Alcantarea ssp.after vinicolor. xVC ‘Raging Fire’, appears to be the best! xVriecantarea 'Inferno' cv. of Vriesea ensiformis X Alcantarea regina. This was created by George and registered 1994. ?Vriesea x Alcan regina, by John Arden. George showed photos of his plants in production, most not yet named, let alone registered. More interesting foliage is coming due to use of newer Alcantarea species. There are no variegates yet. George’s goal is to make a plant with branches all the way down the inflorescence to the rosette. These do better in cooler weather because they come from green leaf Tillandsias from the cloud forrest. They do well in Brisbane, not in Cairns. xVL ‘Spiralling Flame’ has a notable twist in the spike, and the outer foliage gets a red splash in winter. xVL ‘Ervin’ is a ‘knockout’ plant by John Arden. xVL ‘Harmony Too’ does better in Cairns. xVL ‘Cascading Charm’ by John Arden. xVL ‘ Heavenly Wings’ by John Arden, is difficult to grow in Brisbane. xVL ‘ Arden Fireworks’ has a pendulous infloresence. xVL ‘Marichelle’ is hard to grow here, prefers the cool of NZ. xVL ‘Imperial Charm’ by John Arden. 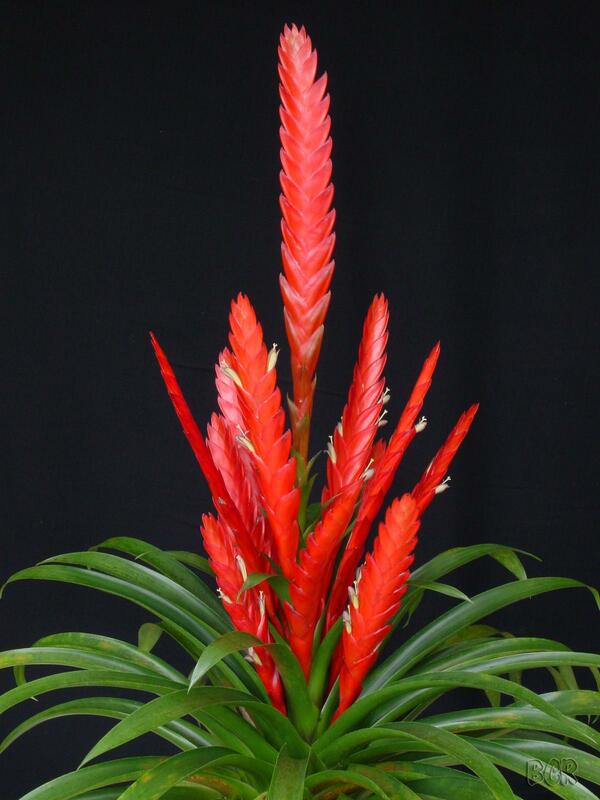 xVrieslandsia 'Blazing Tropics' by John Arden. Parent: Vriesea ('Riviera Flirt' x 'Maroon Delight') Pollen Parent: Tillandsia multicaulis. xVriesgoudaeas VG are ‘the new kids on the block’, there are 5 on the BCR. These are crosses across the two subfamilies Tillandsioideae (Vriesea) and Bromelioideae (Goudaea). Innovators include Chester Skotak, J. Lambert and J. Mitchell from NZ, and Kent Jacobssen from NSW. xVG ‘Supernatural’ from Skotak. Mal Cameron has it, a cross between Vr ‘Barbara’ and Goudaea ospinae (formerly a Vriesea, Chester Skotak 1994). xZiskagoudaea are crosses between two of the newer genera xZizkaea and Goudaea, only 2 on BCR. xVriesgoudaea 'Supernatural" from C. Skotak, E. Beach. 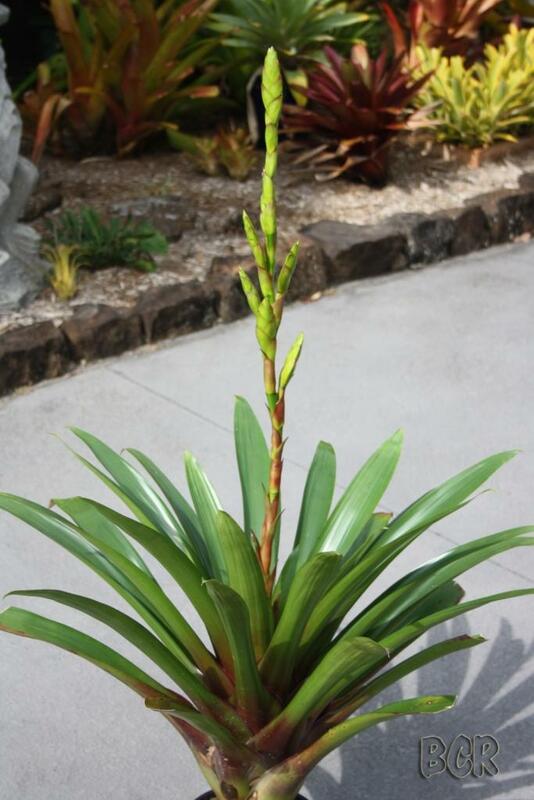 The Spiny Intergenerics, ie., those in the Bromelioideae subfamily. These are more robust, show greater variety, and like the warm subtropics like Brisbane. Hybridisers can select for variety of foliage, inflorescence or both. xHohenmea HM are crosses between Hohenbergias and Aechmeas. Ross Draper of Koah, near Mareeba, has pioneered this work, esp. the Ninja series, of which there are 9. These are very tough, and depend on rain water, are intolerant of town water. xHM ’Dennis Delight’ from Dennis Heckart of Hawaii. xHM ‘Snow White’ from Pattaya Gardens, Thailand. xNeomeas (113) are crosses between Neoregelias and Aechmeas and have been around for years. Kent Jacobsson has created some of these. 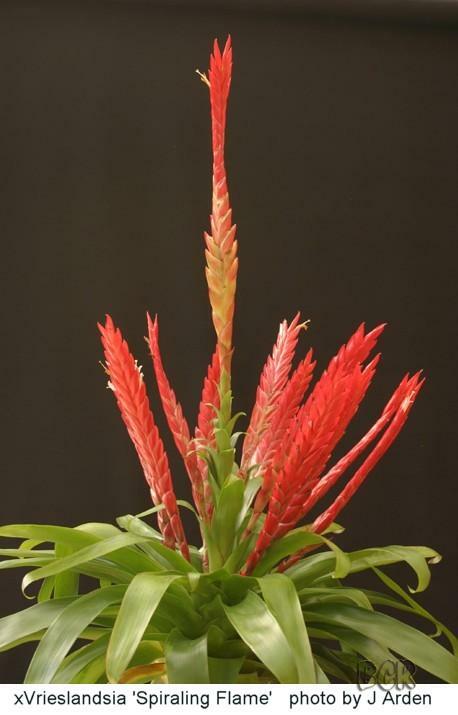 xNeomea ‘Strawberry’ is in member’s collections, is a cross of Neo carolinae x Aechmea recurvata var. benrathii. xNidumeas NM cross Nidularium and Aechmeas. xNidumea ‘Bright Star’ (see below) comes from Kent Jacobssen, in California. xSincoregelia SR are crosses (24) of Sincoraea (new name for many Orthophytum) and Neoregelia. 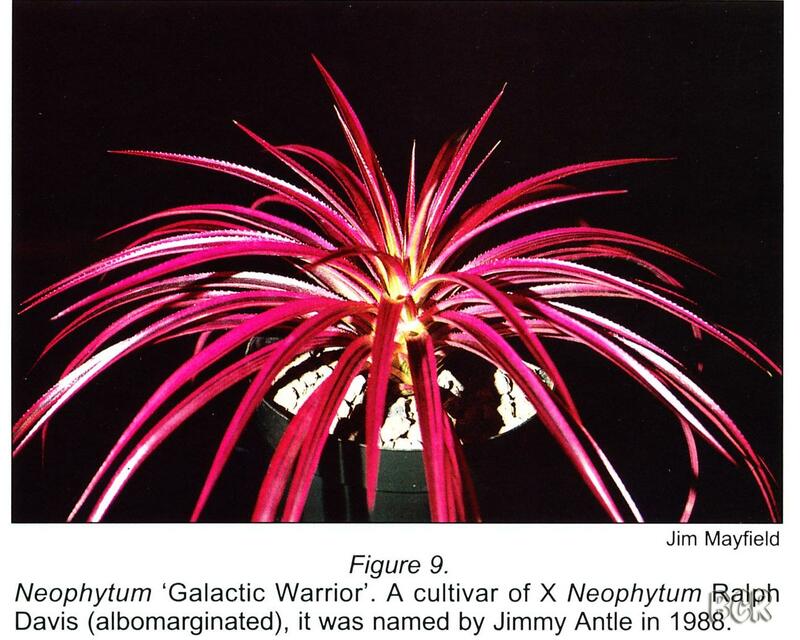 These popular plants were known as xNeophytums before DNA studies lead to a name change. xSR ‘Ralph Davis’ by Nat DeLeon 1973.
xSR ‘Gary Hendrix’ from Nat DeLeon 1983. It’s purple foliage has a rich red wine colour. xPortemeas PM cross Porteas and Aechmeas (12). xPM ‘Phat Pat’ from Skotak 1994. 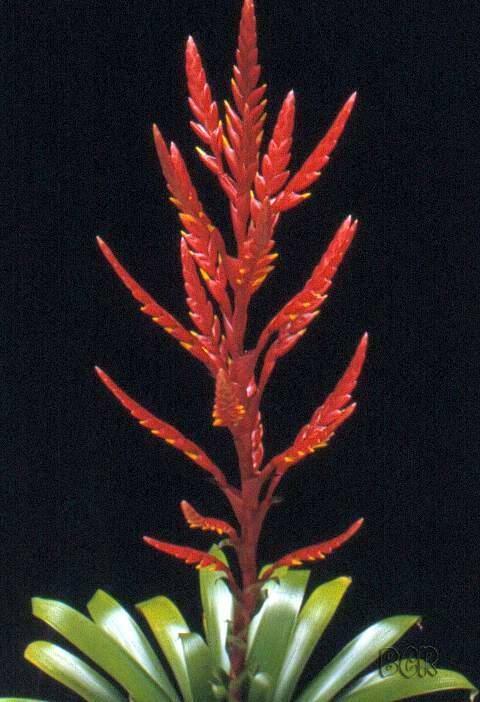 The seed parent has been reclassified as an Aechmea, so this becomes an Aechmea hybrid (and not an intergeneric). Nidularium innocentii x Aechmea fasciata. Note xNeophytum is now xSincoregelia. xBillya ‘Alpha’ (see below) between Billbergia ‘Hallelujah’ and Puya mirabilis. Goudaea x (Vriesea x Lutheria) in N.Z. xHohenquesmea ‘Valley Hoodoo’ crosses Hohenbergia x Quesnelia x Aechmea. Seed Parent: Aechmea disjuncta Pollen Parent: Quesnelia edmundoi var. edmundoi. 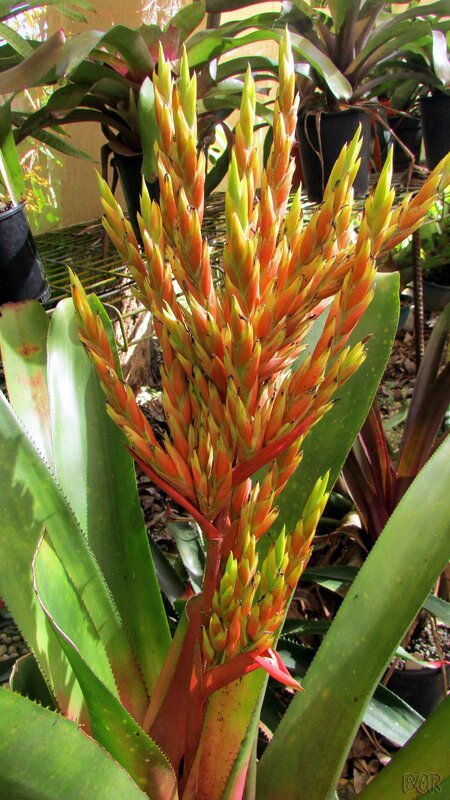 a comprehensive survey of Intergeneric Bromeliads. 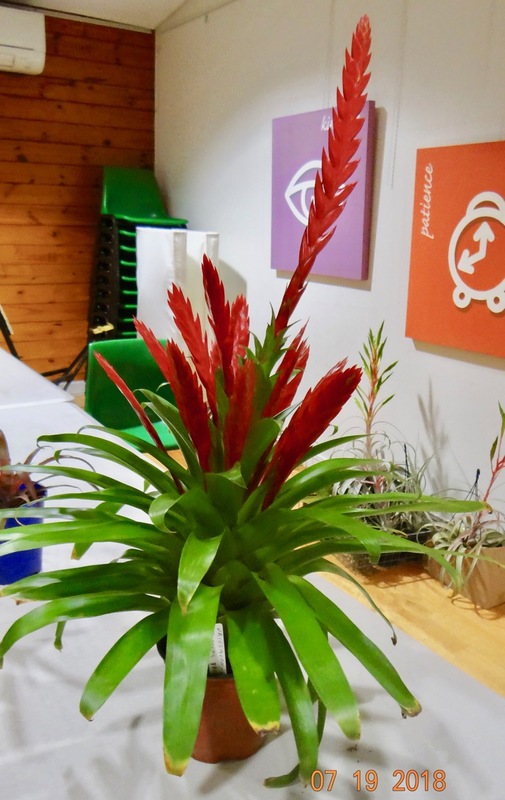 who gives his approach to Fertilising Bromeliads. Coming from a commercial horticulture background, I try to get my plants to maturity as quickly as possible with the biggest inflorescences and the largest number of pups as I can by fertilising as much as I can. Fertiliser is cheap, only making up 2-3% of a plants cost of production, so there is no reason to skimp on fertiliser. I recommend the most expensive fertilisers on the market because you are going to get what you pay for. In controlled release fertilisers CRF, you are going to get a product that will last better than the cheaper options. You will still only get the CRF to last about 2/3 of what they claim, but you must remember these products are designed for European conditions not subtropical QLD and when it gets above 23ºC they will release faster than what they claim. Bear this in mind when selecting a product. In commercial horticulture the labour costs to refertilise a crop can be huge, so choose a product that will last the length of the crops production time. In hobbyists collections this is less of a problem. As well as CRF, I also recommend liquid fertilisers to improve growth by applying them on a weekly to fortnightly basis depending on weather conditions. I use an old weed and feed applicator and it is worth calibrating this applicator so you know how much fertiliser to use. The best way to do this is to fill it full of water and record how long it takes to empty the container when you turn your hose on. The next measurement required is what your flow rate is. I time how long it takes to fill a 20L. bucket. By working out how long by how much, you can work out how much fertiliser is required in solution in the weed and feed. Personally I use a rate 3-5 times stronger than what the manufacturers recommend. I have over time by trial and error discovered that I can burn delicate plants if I apply the higher rates in extremely hot temperatures, but I recommend people do their own trials and work out what works best for them. I would also say that I also irrigate more heavily than most other growers so this may also explain why I don’t suffer more damage from the higher rates of fertiliser I use. There will be a buffet dinner, $40 per head, and you can pay for it now. 1st Billbergia ‘Confetti’. by Alfonso Trudu. 2nd Billbergia ‘Groovy’ by Alfonso Trudu. 3rd Billbergia ‘Louise’. by. Gilda Trudu. 1st Alcantarea regina by Alfonso Trudu. 2nd Catopsis floribunda by Gilda Trudu. 3rd Alcantarea heloisae by Alfonso Trudu. 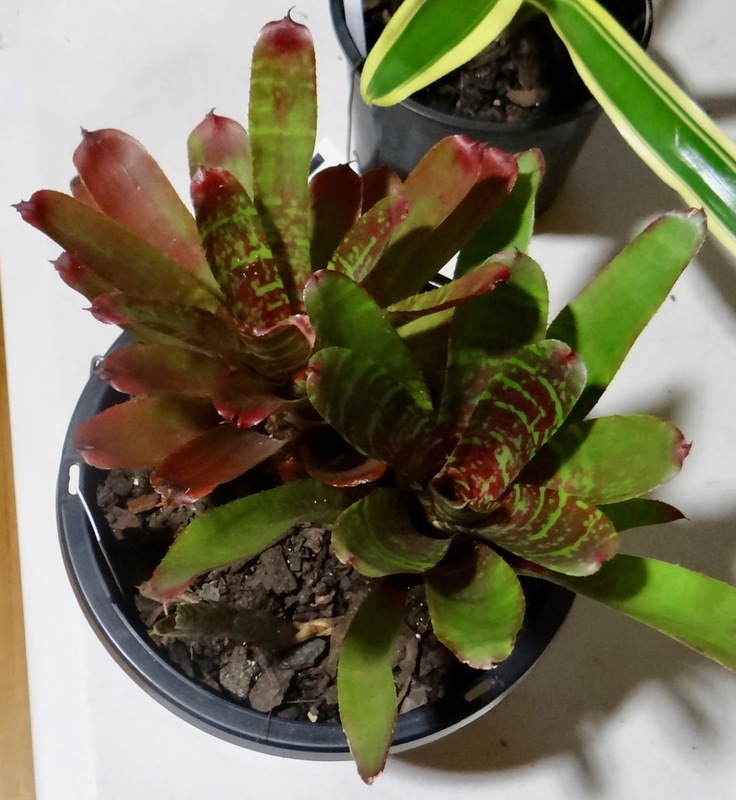 1st Neoregelia ‘Scorpio’ from Gilda Trudu. 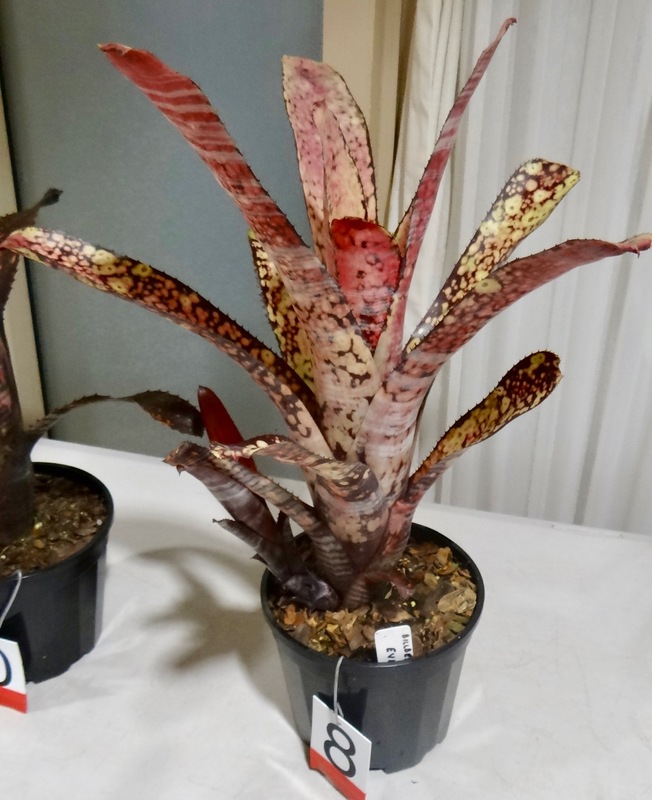 2nd Neoregelia ‘Pheasant’ by Alfonso Trudu. 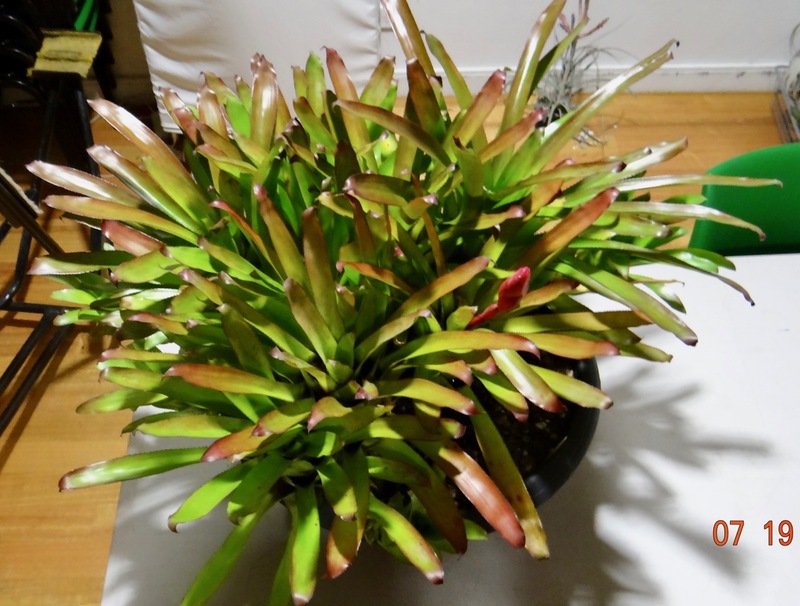 3rd Neoregelia ‘Wild in Oz’ by Gilda Trudu. 1st Tillandsia neglecta by Alfonso Trudu. 3rd Tillandsia stricta by Alfonso Trudu. 1st Billbergia ‘Groovy’ by Livia Diodge. 2nd Billbergia ‘Hallelujah x alfonsi-joannis by Greg Aizlewood. 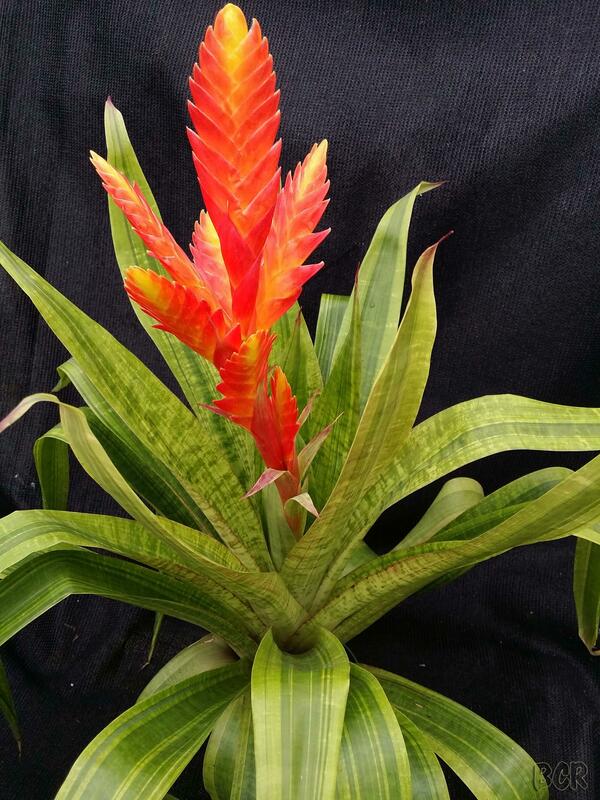 3rd Billbergia ‘Evita’ by Graham Stay. 1st Neoregelia ‘Hot Embers’ by Livia Doidge. 2nd Neoregelia ‘’Gympie Delight’ by Livia Doidge. 3rd Neoregelia ‘Hot Embers’ by Jenny Ittensohn. 1st Tillandsia straminea by Jenny Ittensohn. 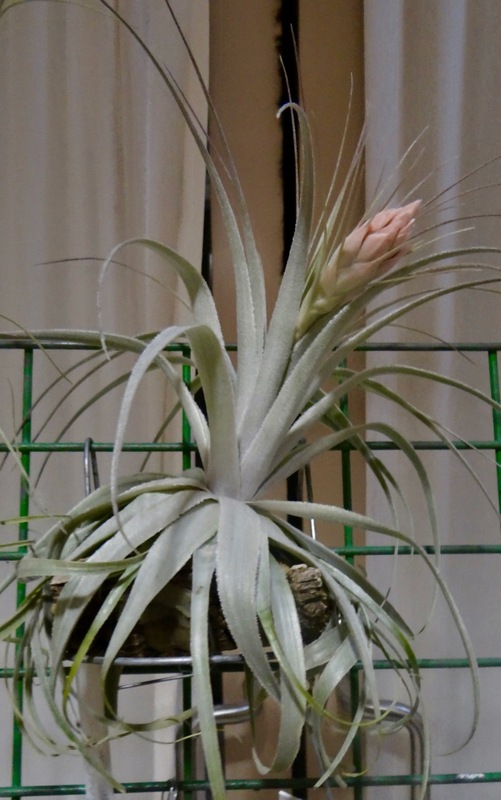 2nd Tillandsia gardneri by ? 3rd Tillandsia stricta by Livia Doidge. 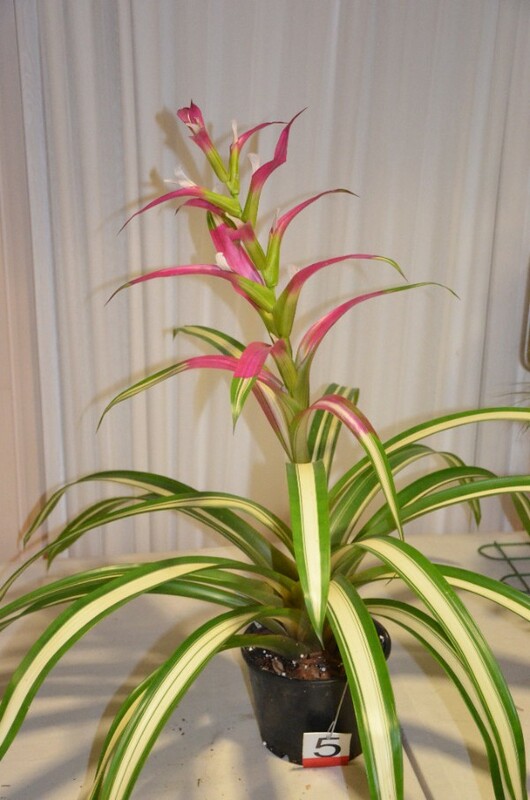 1st Billbergia ‘Hallelujah’ by Barbara McCune. 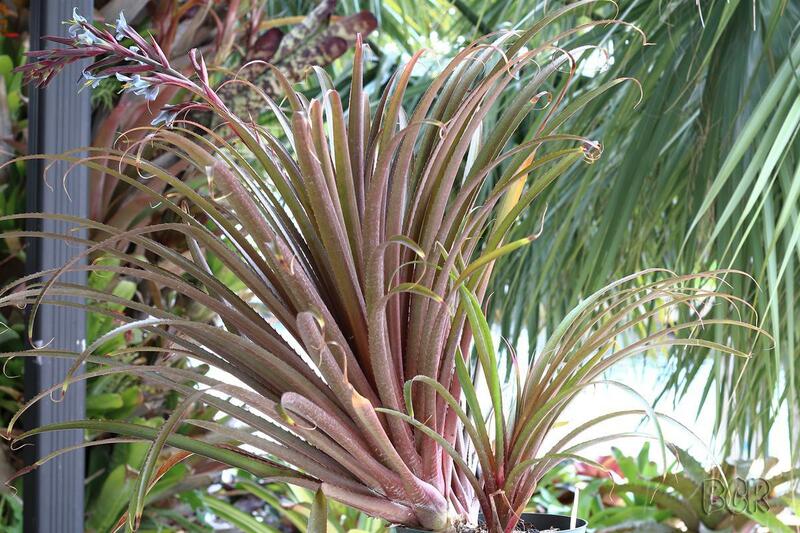 2nd Billbergia 'Groovy' by Barbara McCune. 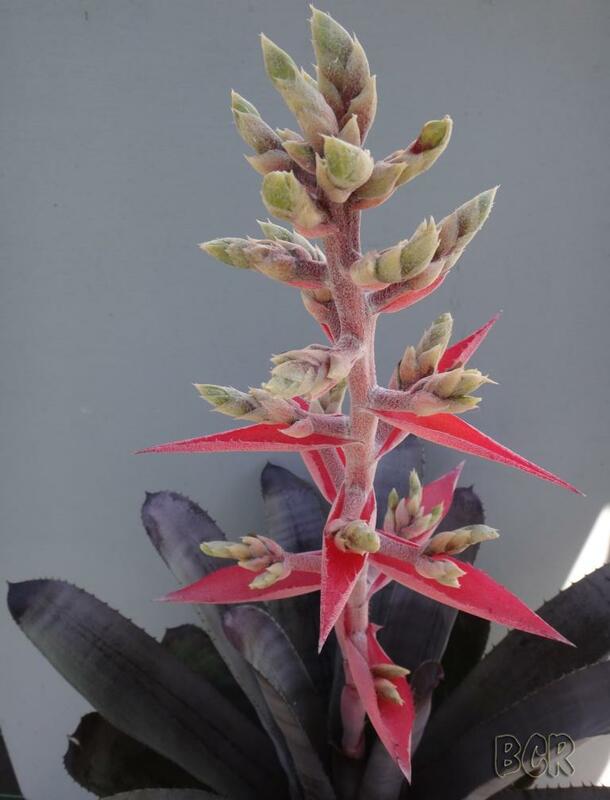 3rd Billbergia 'Supa Dupa Grace' by Barbara McCune. 1st Racinaea multiflora by Ron Jell. 2nd Racinaea pendulispica by Ron Jell. 1st. Neoregelia ‘Hot Embers’ from Barbara McCune. 2nd Neoregelia ‘Wild Rabbit’ by Barbara McCune. 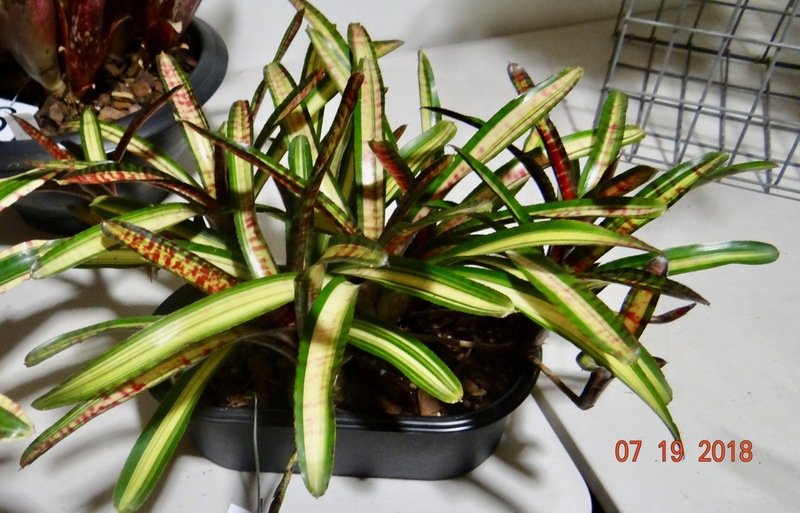 3rd Neoregelia 'Zoe' by Barbara McCune. 1st Tillandsia neglecta from Bruce Dunstan. 2nd Tillandsia streptophylla x ehlersiana by Ron Jell. 3rd Tillandsia intermedia x caput-medusae Ron Jell. Billbergia 'Hallelujah' by Barbara McCune. Tillandsia neglecta by Bruce Dunstan. This beautiful clump is 15 years old and is the darker leaf clone. Neoregelia 'Hot Embers' by Barbara McCune. 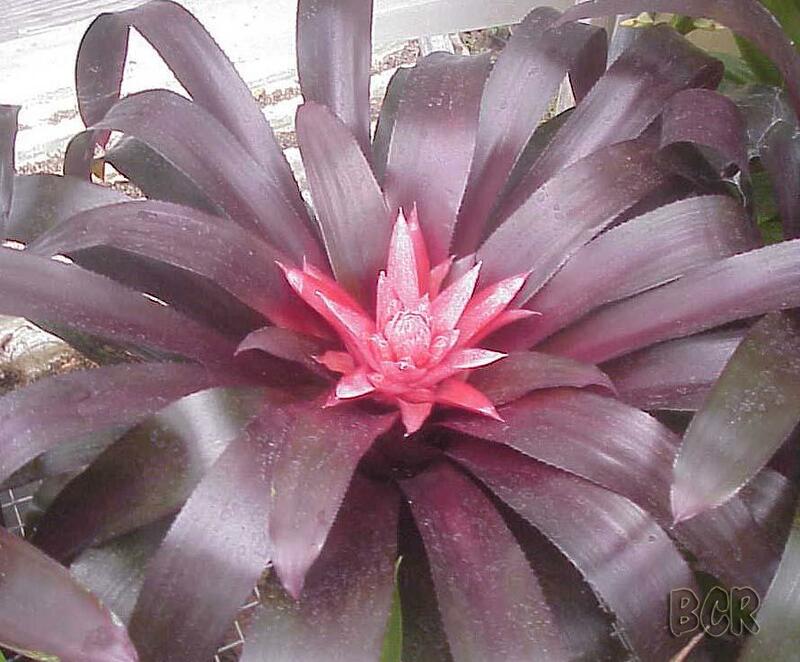 Neoregelia 'Wild Rabbit' by Barbara McCune. Billbergia 'Groovy' by Livia Doidge. 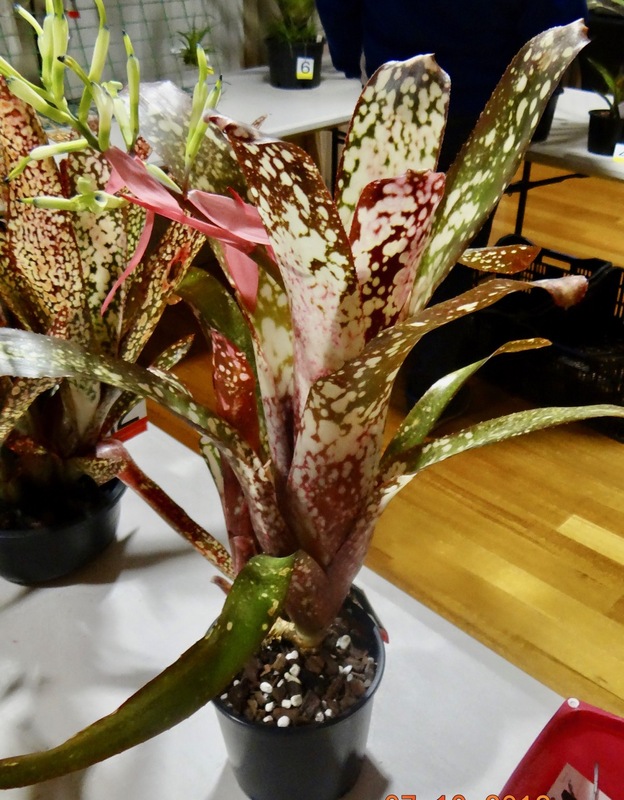 Billbergia 'Evita' by Graeme Stay. Neoregelia 'Pheasant' by Alfonso Trudu. Portea nana is a plant species in the genus Portea. (Mata Atlantica Brasileira) and to Bahia state. This was shown by Narelle Aizlewood for our general interest. Portea nana from Narelle Aizlewood. 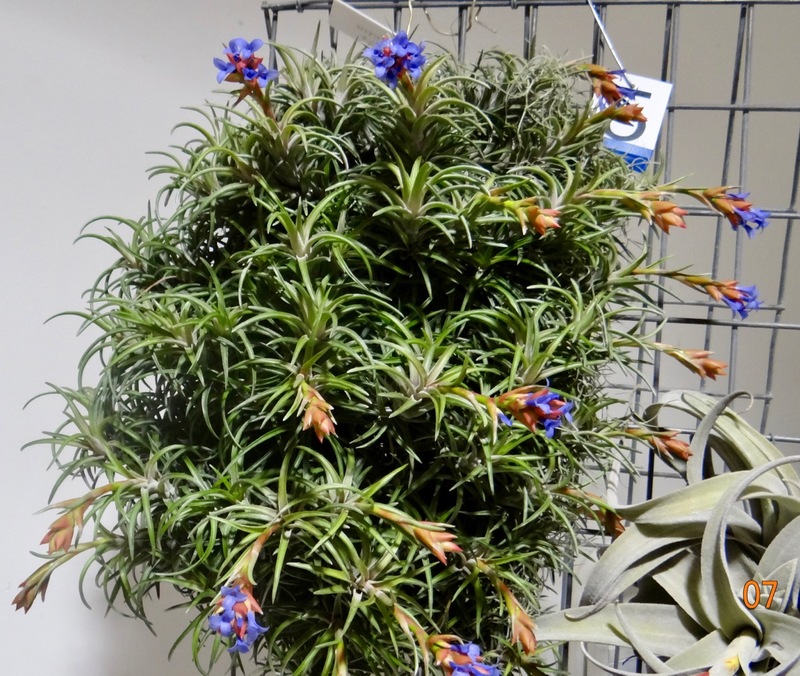 Tom Isaacs on Mounting Tillandsias. Spring Flowering Tillandsias by Bruce Dunstan. Greg Aizlewood on Pests and Diseases.